HT series hot water pump can apply for cleaning oil dirty,boiler wash,burring and so on! 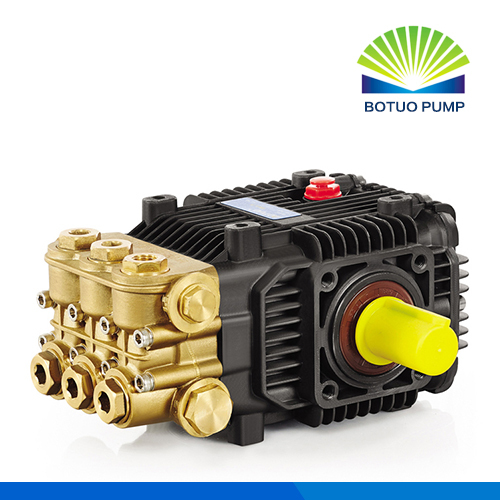 BOTUO HT series hot water pump is dedicated to the application of hot water pump While all pumps can handle a certain degree of high temperature, some pumps are specifically designed to withstand the extra high temperature found in some fluid solutions in applications, such as carpet cleaning, boiler feed, hot-water pressure washers and other industrial high temperature applications. These pumps have a flow range up to 6 GPM (23 L/min) at 70 Bar pressure. A china-made reciprocating Triplex Plunger Pump for high temperature applications. Aluminum crankcase with sight glass and vented dipstick; forged, through-hardened, ground and polished crankshaft; bronze connecting rods; hardened stainless steel plunger bases; solid ceramic plungers; high temperature seals (with fabric reinforcing); stainless steel valves and forged brass manifold.brass manifold. The The Following Parts Catalog Is Available for this pump. If you need further information about these repair kits, or have questions about other specific parts for your pump, please contact you local our distributor or contact our customer service. Looking for ideal Blasting Hot Water Pump Manufacturer & supplier ? We have a wide selection at great prices to help you get creative. All the Hot Water Triplex Plunger Pump 100bar are quality guaranteed. We are China Origin Factory of Blasting Hot Water Pumps. If you have any question, please feel free to contact us.